We depart from Mytilini at 10:00 in the morning. The first destination is the Monastery of Saint Rafael in Thermi. The monastery has been built in the decade of 1960, on the foundations of an older monastery, which functioned in two different periods of the Byzantine season. The next stop is the village of Mantamados, known for its traditional hand-made pottery and for the formidable monastery of Taxiarchis. In the monastery, the visitor can admire the only orthodox icon which exists and dates back to 1.000 B.C. Our next destination is the traditional village of Skala Sykamias with the paved alleys and the stoned stately houses, built since 19th century. 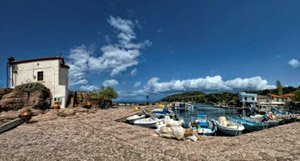 Apart from the house of the popular writer of literature Stratis Myrivilis, another small church called “ Panagia Gorgona” dominates the small and graphic port of the village with its special beauty. After a half hour distance we will arrive at the region of Molyvos, which is known as Mithimna. Very close to Molyvos, there are the beach of Eftalou and the medicinal spa. 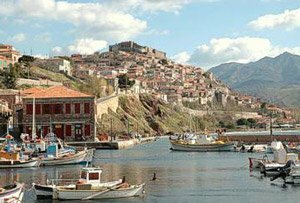 Molyvos' castle which dates back to the 13th century, with the paved alleys of the market and the local traditional port are the most worthwhile characteristics of the village. We stop for lunch in a place of your choice. Later, we will visit the village called Petra, with the special rock on which the church of “Panagia Glykofilousa” with 114 stairs, is built. Near Petra there is the region called Petri,which is known for its legendary source called “Ahiliopigada”. The excursion can be combined with a night cruise to the caves and the islands of Petra (Saint George) by ship exactly at the time of the popular sunset. The ship owns a glass floor. The duration of the whole tour is 3 hours. Return in Mytilene and end of the tour. Arrival time 19:00. If the cruise takes place, arrival time 21:00. The excursion includes: Luxurious Mini Bus with fuel included in the price and a professional driver, who provides the information of the excursion in English. 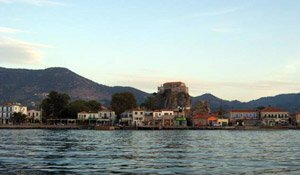 The excursion does not include: Food, drinks, tickets for the museums and the archaeological sites, tickets of the cruise. Extra: Night cruise 25€ per person.